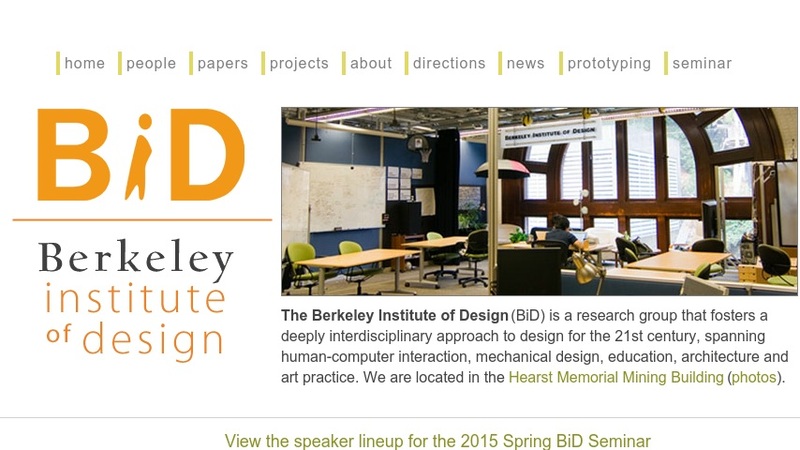 The Berkeley Institute of Design (BID) conducts research and educational activities that emphasize an interdisciplinary approach to designing interactive environments. Under the topic of "environments," the website includes "architectural spaces, products, web sites, and other artifacts that support complex human activity." Given the current "era of ubiquitous technologies," the organization's approach combines technical and social/humanist perspectives drawing on psychology, social sciences and art practice. Its goal is to understand human behavior and the experience that technology should enhance, while remaining committed to social values and critical reflection. Projects include: MultiView Papier-Mï¿½chï¿½, Books with Voices, The Designers' Outpost, Digital Chemistry Project, SUGAR (CAD for MEMS), flexonics editorial, UCWISE, paradoxes in creativity, Organum, and Mobster. This site is also reviewed in the January 14, 2005_NSDL MET Report_.